Picking the top big wave moments from the past 100 years. Surf News, 22 February, 2014 – Big wave surfing has leaped to levels scarcely to be credited here in the 21st Century. Whether towing or paddling into those monsters, there is an elite group of big-wave surfers combining technology and guts motivated by thrills, fame and money, in the pursuit of that ellusive hundred-foot wave. A lot has happened in big-wave surfing this past winter: The Hercules Swell and Jamie Mitchell’s Belharra bomb, Maya Gabeira nearly drowning at Nazare and the resultant hu hu, a return to tow surfing at Jaws for the shooting of Point Break 2, Twiggy winning the Mavericks contest, big days at Teahupoo, Todos Santos, Mullaghmore. A lot went down during the winter of 2013/2014. A lot happened last winter. A lot has happened in the last five years. A lot has happened since Laird’s Millennium wave. A lot has happened in the hundred years since Tom Blake modernized the olo, which let Waikiki surfers paddle way outside and catch the bluebirds – as Duke Kahanamoku did at Outside Castles in 1917. The history of big wave surfing is dense and getting denser, and the challenge of Go Big: Greatest Moments in Big Wave Surfing will be sorting out the 40 or so surfers, discoveries, incidents, innovations and big days that are on the Mount Rushmore of big wave history: From Makaha to Mavericks, Duke to Dorian, olo to PWC, elephant guns to paddling vests, paddle surfing to tow surfing and back to the recent return to paddle surfing. Go Big will be book #17.5 for Ben Marcus, and while it will be easier than 365 Surfboards, it won’t be easy wading through 100 years of big-wave surfing history to find those 40 Greatest Moments that matter most. It is a big book that needs a little help: Editorial help choosing from a hundred years of big-wave surfing, the 40 or so Greatest Moments. And also financial help boosting the photo and research budget to make this book as solid as possible – and pay the photographers properly. The Swell of ’69 at Makaha with Greg Noll. The 1990 Quiksilver in Memory of Eddie Aikau contest at Waimea Bay. 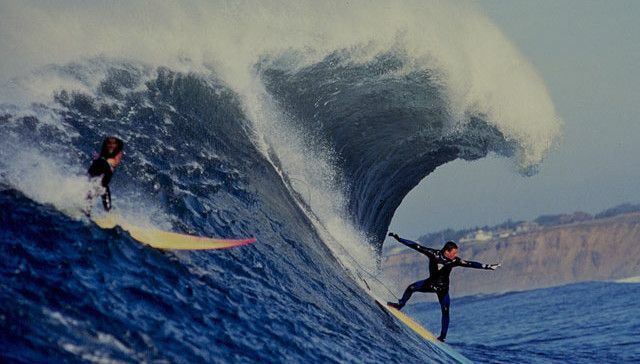 The 1992 week at Mavericks that ended Mark Foo’s legend, and began Jay Moriarity’s. The innovation of tow surfing around 1992 by Laird, Buzzy, Darrick and their Strapped friends. Laird Hamilton’s incredible Millennium Wave at Teahupoo in August of 2000. Garrett McNamara’s balls-out barrel at Jaws in 2002 (Almost forgot that one didn’t you? Still never been topped, really). In 2013, Shawn Dollar’s 61-foot paddle in at Cortes Bank and Shane Dorian’s XXL-winning Ride of the Year paddle in and barrel at Jaws. The paddle vest is the key, but so are PWC, elephant guns of the 1950s, Tom Blake’s olo, the leash, the XXL Awards – a lot of technical and cultural innovations over the years. There is a long list of possible Greatest Moments to be included in the book, and there is a Facebook page to get outside editorial help – and also an IndieGoGo page to help bump up the photo budget. Writing books is a lonely business – and most photo budgets are never enough – so the hope is the outside world will tune into the Facebook page and chime in as the book progresses, and decisions are made. And some CrowdFunding help with the photo budget would be nice, to pay the photographers top dollar for their Greatest Moments. This below is the start of a rough list of the moments being considered for Greatest Moments in Big Wave Surfing. There’s about 100 moments listed here, and if Bill Sharp or Ken Bradshaw or Brock Little or Evan looked it over, they’d probably say there’s a hundred more missing and a couple dozen that shouldn’t be there. See something missing? See something that shouldn’t be there? Want to argue something? Please do. This list will get longer before it’s whittled down to the 40 Greatest Moments – but you have to start somewhere. This article was posted in Featured and tagged Ben Marcus, Big Wave, books, surfers. Bookmark the this page.